It had been a time when the world needed legends, those years so long past now. Because there was something else legends could offer, or so the Poet believed. He didn't know quite what—ghouls were not skilled at imagination. Their world was a concrete one, one of stone and flesh. Struggle and survival. Survival predicated on others' deaths. Far in the future, when our sun grows ever larger, scorching the earth. When seas become poisonous and men are needed to guard the crypts from the scavengers of the dead. 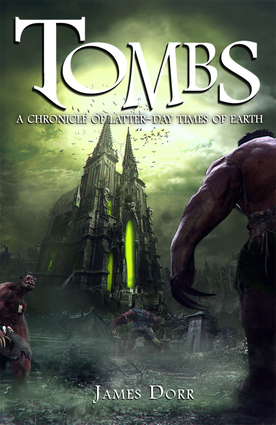 A ghoul-poet will share stories of love and loss, death and resurrection.Tombs is a beautifully written examination of the human condition of life, love, and death, through the prism of a dystopian apocalypse. Indiana writer James Dorr's The Tears of Isis was a 2014 Bram Stoker Award® nominee for Superior Achievement in a Fiction Collection. Other books include Strange Mistresses: Tales of Wonder and Romance, Darker Loves: Tales of Mystery and Regret, and his all-poetry Vamps (A Restrospective). An Active Member of HWA and SFWA with nearly 400 individual appearances from Airships & Automatons and Alfred Hitchcock's Mystery Magazine to Xenophilia and Yellow Bat Review, Dorr invites readers to visit his blog.